The groom's cake is often chocolate. The groom may prefer a basic chocolate cake or could venture into different chocolate flavors, such as German chocolate or a brownie chocolate. There are many types of chocolate cakes available for the groom's cake that are fun and definitely delicious. With so many luxurious cake flavor options available, why would couples choose something as common as chocolate for the groom's cake? Many men, in fact, are not as into the elaborate wedding details as their brides-to-be, and a simple cake appeals to their tastes. Furthermore, the groom's cake is often a luxury detail and basic chocolate flavors are more economical, letting couples indulge in this Southern tradition without facing increasingly high wedding cake prices for both cakes. A simple chocolate groom's cake also gives a couple more freedom to select an elaborate taste sensation for their wedding cake, since guests will also have the option of a classic chocolate cake if the more gourmet confection does not appeal to them. With so many options for different chocolate flavors (and the cake can even include more than one type of chocolate in different layers), a chocolate groom's cake can be just as personalized as the more elaborate wedding cake. Couples may at first be reluctant to opt for chocolate flavors because of the dark color - so opposite the traditional wedding white. While some couples prefer that "opposites attract" coloration between the wedding and groom's cakes, today's chocolate cakes do not need to be dark. The cake's icing, in fact, can be any color to match different groom's cake ideas such as sports team logos, favorite hobbies, or simply favorite colors. White chocolate icing can provide a light-colored but still chocolaty finish to the cake, or any type of decoration can be used to disguise the rich dark interior of the treat. Some grooms prefer a less intense chocolate flavor for their cake, and it is possible to create one-of-a-kind cakes with a subtle hint of chocolate. 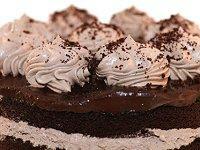 A cookies-and-cream cake, for example, may use a vanilla sponge cake with crumbled chocolate cookies baked in. Other mix-ins such as candy bar pieces, chocolate chips, or fudge marbling can also add a hint of chocolate without overdoing the taste. 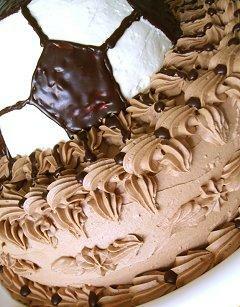 Another way to add chocolate to the cake is to use chocolate accents as decorations. Chocolate chips come in a range of sizes and different flavors (milk, dark, and white chocolate as well as butterscotch, mint, and peanut butter) and can add tasty texture to the cake. Chocolate sugar wafers, chocolate licorice, or candy-covered chocolate bits can add not only a different type of chocolate taste, but also a range of colors and textures for a truly unique groom's cake. There are even more unusual options for chocolate groom's cakes as well. A Hostess cupcake cake or cupcake groom's cake uses individual snack cakes arranged in a meaningful pattern, or the entire cake can be turned into one extra-large variation of a familiar treat by separating two chocolate layers with a creamy whipped filling. Using a peanut butter filling can even give the entire cake the taste and appearance of a giant peanut butter cup. Other options include using chocolate cake donuts, truffles, chocolate kisses to give any groom's cake a chocolate flair. Before indulging wholeheartedly into an elaborate chocolate confection, couples should be aware that despite its popularity, not everyone likes chocolate and some guests will not sample a chocoholic groom's cake no matter how carefully it is designed. Chocolate can also create treacherous stains on pristine wedding gowns or tuxedo shirts, and the cake should be handled carefully. If the wedding reception (or wedding rehearsal dinner, or whenever the groom's cake will be served) is outdoors, the cake should be carefully stored and displayed in the shade so the chocolate icing will not melt prematurely. With care, however, the cake - no matter what flavor - can be a wonderful wedding reception centerpiece as well as a tasty treat. The point of a groom's cake is to honor the groom and his personality, and a chocolate groom's cake is not only rich and decadent but also can be quirky and fun. There are hundreds of options for creating a unique chocolate cake, whether the groom wants a rich confection or just a hint of chocolaty goodness. From white to dark, chocolate is the perfect choice for a groom's cake as unique and sweet as the groom himself.